Let's say your friend has purchased a boat, or you've recently made a new friend who has a boat, and they invite you on a cruise. You're about to discover the joy of OPB: Other People's Boats. Whether a sunset sail, an overnight, or an extended adventure, the trip might be more fun if you're not completely clueless about the parts of a boat and frequent phrases. And if this isn't your first rodeo? Share this with someone who might need a leg up for their first outing. Whether you're hopping aboard for your first cruise or want to brush up on your boat terminology (LOA, anyone? ), this cheat-sheet will help you to decipher some on-the-water lingo. Read on to familiarize yourself with some of the more frequently used words and phrases, translated into every day English. A quick sidenote while you're here: Dockwa is free to use for both boaters and marinas! No sign-up, membership, or annual fees, no markup, and no reservation surcharge. 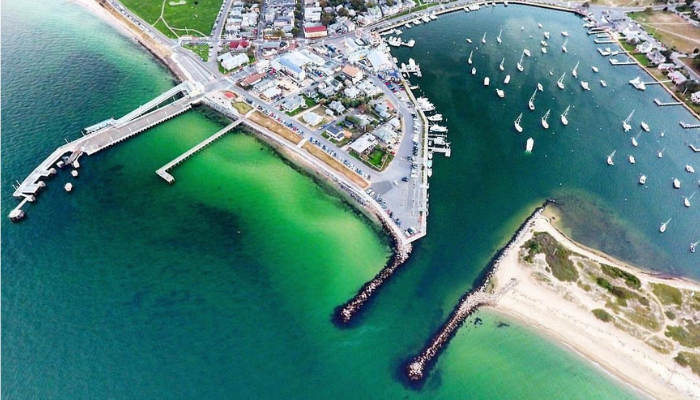 Marinas only pay a flat per-reservation transaction fee, which covers/replaces the credit card processing they'd otherwise pay – and by using Dockwa they get a ton of marina management tools and marketing help. Cool, right? Float plan: A float plan is a document detailing the intended agenda for the boat, including vessel, crew, and equipment information, date of departure, date(s) of arrival, fuel stops, overnights, and dockage/anchorage reservations. Slip vs. Dock: A slip is the section of a dock in which captains park their boats. The dock can refer to the general area of the marina where the boats tie up ("Let's head down to the dock") as well the actual flat floating structure itself ("This dock is badly damaged.") A marina's docks can encompass its slips, linear dockage, fuel dock, dinghy dock, and sometimes the ship's store or office. On or near your slip, you may find cleats (ideally), electrical hookups, water hookup. Down the dock you may find a dock cart for toting gear or provisions, an ice machine, and bathrooms. Linear Dockage: As opposed to a slip a boat pulls into, linear dockage is a marina configuration which basically docks boats by lining them up end to end along the dock, one boat's bow to another boat's stern. Mooring ball: Also casually referred to as "a mooring," a mooring ball floats on the water's surface and is secured to the harbor bottom typically via a large, heavy, and permanently-installed anchor, cement block, or other nearly immovable weight. Attached to a mooring ball is typically a pennant, which is a length of rope with a loop at the end – the loop not only helps you grab the mooring ball's pennant using the boat's boat hook, it also is the loop through which a line will run to secure the boat to the mooring. Different harbors label their mooring balls different ways, and mooring balls vary by the size of vessel they can accommodate. Piling: A piling is a heavy post, like a telephone pole, which is embedded into the sea floor and used to secure docks in place or to which boats can be tied. 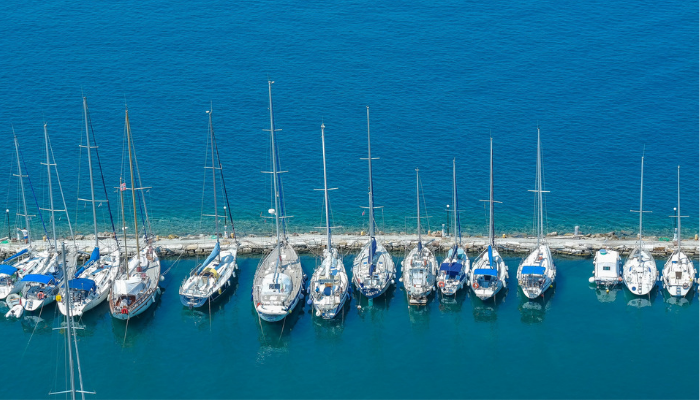 When reserving dockage at a marina, when the marina asks for your vessel's Length Overall (LOA) the marina is asking for – wait for it – the overall length of the boat. As in, all of your boat. The whole enchilada. The total tamale. No skimping, no "Oops, when did I get a swim platform??" The boat's branding, marketing materials, or the boat documentation that was done pre-customization may no longer have any bearing on reality: in the context of reserving dock space or a mooring, the marina wants needs to know your boat's literal length overall as measured from its aft-most to forward-most appendages, from the tip of your bowsprit to the back of your swim platform. Read more about why LOA matters. Height: When booking dockage, the height of your vessel may exclude some marinas or delay your ETA due to bridge height restrictions. 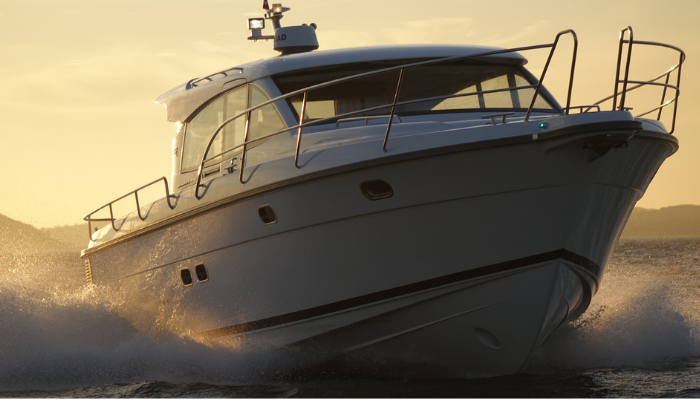 Waterline Length: The length of a boat's hull where it intersects with the water. Draft: A boat's draft is the measurement of vertical distance between the boat's waterline and the bottom of its keel, and this measurement determines the minimum depth of water over which a boat can safely navigate. When you hear "What does she draw?" the question at hand is, "What depth of water is required for the boat to float?" As a captain requests dockage from a marina, the marinas will likely ask for a boat's draft as they take the reservation details, and often posts Mean Low Water of its harbor and slips so that potential guests can make the call without an extra VHF or phone call. Beam: The width of any boat at its widest point. A marina needs to know your beam depending on the size of their slips, or the width of your beam. For example, if a marina has only single-vessel slips for boats up to a 16' beam, a large catamaran will not fit and will need to go on the linear dockage if available. You may hear beam in other contexts: If a vessel or landmark is abeam, that means it is directly to port or starboard of your boat. If you are sailing on a beam reach, you are sailing a course 90° off the wind, with the wind abeam. VHF: The VHF is the on-board radio transmitter. Marinas (as well as other boaters, harbor patrols, and the Coast Guard) monitor specific VHF channels. Once you've reserved your dockage, a captain will put out a radio call on the channel the marina monitors to let them know he is approaching, request a slip assignment if not provided via the app's Chat function, or ask for assistance. Man Overboard: "Man Overboard!" (abbreviated as MOB) is the term to indicate to a boat's crew and passengers that someone has gone in the water. If you hear it, and have not been assigned another job in the case of this happening, you can assist by simply finding the MOB and keeping a finger pointed at him/her at all times until rescued. You may be instructed to hit the Man Overboard button, which is sometimes labeled "MOB" on a boat's control panel. Lifering: The lifering – also known as a ring buoy or life buoy – is an orange, red, or white ring which is secured to the boat's stern and designed to be thrown to a person in the water to provide buoyancy and prevent drowning. Some modern liferings are outfitted with water-activated lights and tracking devices to aid rescue at night. Unlike an throwable, liferings have a long line attached to them which is meant to also be attached to the boat, so that once an MOB catches it, he/she can be pulled in with less exertion on their part. Throwable: A throwable a type of personal flotation device (PFD) which can be thrown to someone in the water to help prevent them from drowning. 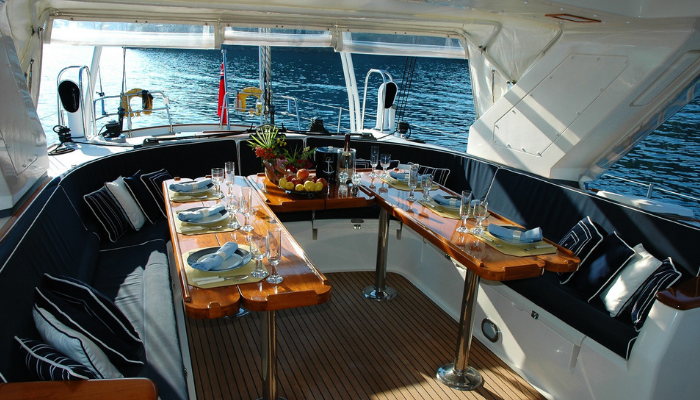 On recreational boats, they serve a second function as seat cushions. Boom: The boom on a sailboat is spar (pole), along the foot of the mainsail which improves sail shape and serves as an attachment point for sail control lines. The boom is located above the cockpit – which means it is also located above the crew in the cockpit. When sailing, be mindful of where the boom is. If someone screams "BOOM!" or "DUCK!" don't look, just duck immediately to avoid injury. Lifelines: A lifeline is a wire or cable that runs along the outside of the deck, supported by stanchions, to prevent crew or gear from falling overboard. Properly installed, you can dangle your body – and several others – over a lifeline (and thus, over the side of the boat) and feel confident you will not go in the water. The Rail: Many boats will have a toerail along the edge of a boat's deck. If when sailing someone asks you to get on the rail, they are likely asking you to hike out as far as you can over the toerail (or where a toerail would typically be) on the high side of the boat. Knots: A measurement of speed in nautical miles per hour. RPMs: The revolutions per minute on a boat's engine dictates how fast a vessel can accelerate and travel in various sea states. Planing: Getting a boat to plane involves physics better explained by Wikipedia than I could hope to accomplish. In layman's terms for a first-time cruiser, just know that getting a boat to plane on a powerboat or dinghy may require bringing up the RPMs relatively quickly. Heeling: Heeling is when a sailboat leans over in the water as its sails are pushed by the wind. When heeling, you will be safest and likely more useful (even if it's just your weight helping to flatten the boat) on the windward side of the boat. Bow & Stern: Generally speaking, the bow is the front location of the boat, and the stern is the back. Port & Starboard: When facing the bow of a boat, port is to your left and starboard is to your right. You may hear phrases like, "There's a boat to port," "Leave the mark to starboard," or "The gallon of rum is in the starboard aft cabin." Windward & Leeward: Windward is the point up wind from the point of reference (i.e., you or the boat you're on). Leeward is the direction downwind from the point of reference. The side of a ship that is to leeward is the lee side. On a sailboat that is heeling, the windward side is always the high side and the leeward side is the side of the boat closest to the water. When sailing (particularly racing), someone yelling, "Get to windward!" translates to "Please make your way to the high side of the boat immediately if not sooner." Winch: Merriam-Webster defines a winch as "any of various machines or instruments for hauling or pulling; especially: a powerful machine with one or more drums on which to coil a rope, cable, or chain for hauling or hoisting." On a sailboat, crew will use a winch to hoist or trim a sail by coiling the sail's sheet or halyard onto it for added leverage. Once pulled in by hand as far as possible, they'll use a winch handle to trim the sail in the rest of the way or to hoist the sail to its uppermost point. Bilge: The bilge is lowest section of a boat where water typically collects. If someone tells you to "check the bilge," they are asking you to verify (you may have to lift up a floorboard in the main salon) that there is little or no water collected, which can weigh a boat down and thus increase drag. If the bilge has water, you can use a bilge pump to empty it. If ever you see water coming above the floorboards, let someone know immediately. If you are a smoker, go to the stern (or "go aft") to smoke. 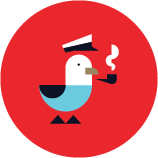 If you smoke anywhere forward of your fellow shipmates, the smoke will be blown on to them. On some boats, gentlemen (and some ladies) will relieve themselves off the side of the boat so as to avoid going below, opening valves for the head, etc. Always go aft and to leeward to do this, and always keep one hand on the boat. If you feel seasick and believe you are going to be physically ill, make your way aft and to leeward if it is safe to do so. As you do, let your captain know – if on a sailboat that is very heeled over, he may opt to right the boat (by turning into the wind, luffing the sails – which also slows or stops the boat) or ask you to go below rather than put yourself in a potentially precarious position on your first outing. Chart: A nautical chart is a graphic representation of a sea, lake, or river's area and nearby coastal regions. Depending on the scale of the chart, it may show water depth, navigation aids, navigational hazards, and man-made structures such as harbors, locks, bridges, and buildings. Most boats keep paper chart books of the boat's most frequented region aboard, should the boat's navigation system fail. Course: Your boat's course is the direction in which a vessel is heading or is intended to be steered – its direction through the water. Heading vs. Bearing: Your heading is the compass direction in which a vessel is pointing. Your bearing is the compass reading taken off an object in relation to the observer. Marks: A mark is a fixed buoyage indicator, such as a lighted buoy, a day beacon, can, or mile marker. Click here for the U.S. Coast Guard's excellent guide to navigation aids and right of way rules. ETA: Estimated time of arrival. In boating, an accurate ETA is like seeing a mermaid: an impossibility that may be the result of delusion or hallucination, but intriguing to ponder and share nonetheless. Dock hand: A dock hand is an employee of the marina or yacht club you're about to tie up to. Whenever possible, dock hands make themselves available to catch lines, assist a vessel in tying up or shoving off, answer questions about the marina and surrounding area to the best of their ability, and, if applicable, provide pumpout or fuel service. Hull: The hull is the watertight body of a boat, commonly made of wood, aluminum, or fiberglass. To reduce hull weakening due to water or ultraviolet light, manufacturers or boat owners will paint a fiberglass boat's hull with gelcoat, which requires repair if damaged while underway or docking. Fender: In boating, a fender – typically made out of rubber, foam elastomer, or plastic – is used to cushion the force of a boat as it approaches or remains secured to a dock, a wall, or another boat, in order to prevent damage to the boat, other boats, or structures. 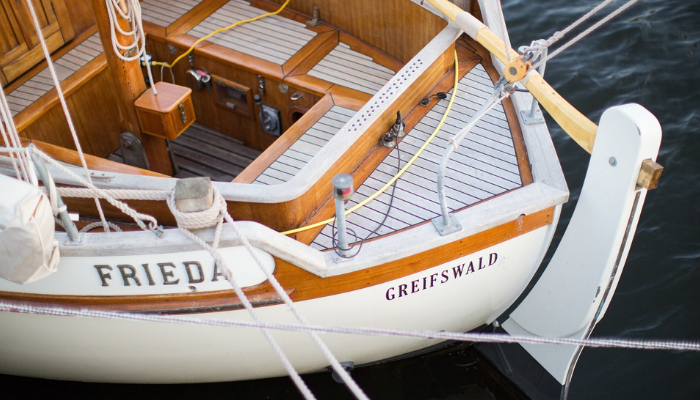 A fender may be tied to the rail, lifelines, or cleats aboard a boat, a cleat on a boat or dock, or used to "hand-fend" as the boat approaches or departs a slip or raft-up. Cleat: Merriam-Webster defines a cleat as, "a wooden or metal fitting usually with two projecting horns around which a rope may be made fast." Cruising, you'll find cleats on board the boat as well as on the dock, and when docking the bow line, stern line, and spring lines will secure the boat to the dock by making fast a cleat knot on each. Lines vs. ropes: On a boat, the words rope and line are not interchangeable. When cordage has not been assigned to a task, it's just a rope. Once a rope has been prepped or is in use for a specific job, such as securing an anchor to the bow, securing the boat to the dock, or hanging a fender off the rail, the rope is now in use as a line. A line is referred to by the job it performs: anchor line, dock line, fender line, etc. Sheets vs. halyards: A sheet is the word for a line being used to trim a sail. A halyard is the term for a line used to hoist a sail. Like the lines, these also get named: main sheet (the sheet controlling the mainsail), jib sheets (a pair of sheets that control jib trim), spinnaker sheets, main halyard, jib halyard, spinnaker halyard, and so on. When under sail, whichever sheet is in use is a working sheet. The sheet not in use is the lazy sheet. Leeway: Leeway refers to the sideways drift of a ship to leeward of the desired course. If while docking the helmsman (or anyone) asks you "Do I have some leeway?" no matter which way the boat is moving, that person is asking for an estimate as to the boat's distance from the dock or any other fixed mark. Helm: The helm is technically the name of the location where the steering and engine controls are located, and can be used as a the interchangeably for the ship's wheel itself, e.g. "Take the helm." Cockpit: The cockpit is traditionally the open well in the boat's deck, typically toward the stern, which houses the helm. Forward vs. Aft: Forward can be used a few ways: when you are moving towards the bow, this called "going forward." Forward also refers to the general area of the boat that is towards the bow. When are you moving towards the rear end of the boat, you are "going aft." Companionway: A boat's companionway is a raised hatch that has a ladder which leads below. 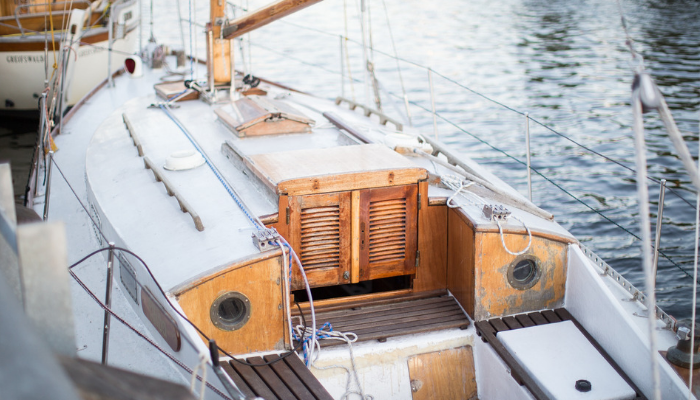 You may find hand-holds on the sides of the ladder or the sides of the steps turned up on both sides to help you step while the boat is heeled over. Dodger: A dodger is a frame-supported canvas structure (usually with clear vinyl windows) which covers part of the cockpit and the entrance to the companionway, thus also helping protect the interior of the sailboat from weather and waves. A dodger can also help keep a boat's helmsman and crew dry. Bimini top: A bimini top would likely be made of the same material as a dodger, and stands aft of the cockpit, above the helmsman, but does not provide protection from forward waves. Transom: The transom is that part of the stern of a vessel where the port and starboard sides of its hull meet and a critical part of the hull. Going forward from the transom, the two sides of a boat curve together to meet at the bow, forming the shape of a boat's hull. Galley: The galley is the kitchen on a boat. Cabin: Any enclosed room on a boat. Head: The head is the bathroom. You may hear someone say, "I'm going to hit the head," or "The head is broken," or "Tommy is no longer allowed to use the head." Alternatively, a sailor might say, "I'm gonna hit the head," and then make moves to the stern of the boat toward that purpose. Nav station: Prior to the world of iPads and on-board wifi, many boats had a broad table below deck, at which a captain could plot a course on a large paper chart while still in sight of the helm. Also on, near, or in the nav station you'll likely find a VHF radio, the boat's control panel, and approximately 400 pairs of old beat-up sunglasses. Stow: When underway, heeling and waves can send gear sailing across salons and cabins. Stowing your gear – meaning putting it away in a cabinet, strapping it down with lines, or otherwise packing it securely – will keep electronics from breaking, prevent beer from exploding, help crew negotiate piles of sails without worrying about bags, and overall will provide more peace of mind to anyone above to not hear pandemonium below every time the boat hits a wave. Tack & Jibe: While tacking and jibing are sailing maneuvers, if you are below deck and hear either term yelled on deck, or someone yells it down the companionway at you, take this as an indication that you should hold on to something. What clutch boating terms did I miss? Email suggestions to becky@dockwa.com or post in our Facebook Group.